Signal International lawsuit settlement: Guest workers for Katrina rebuilding were deceived, locked into crowded camps. 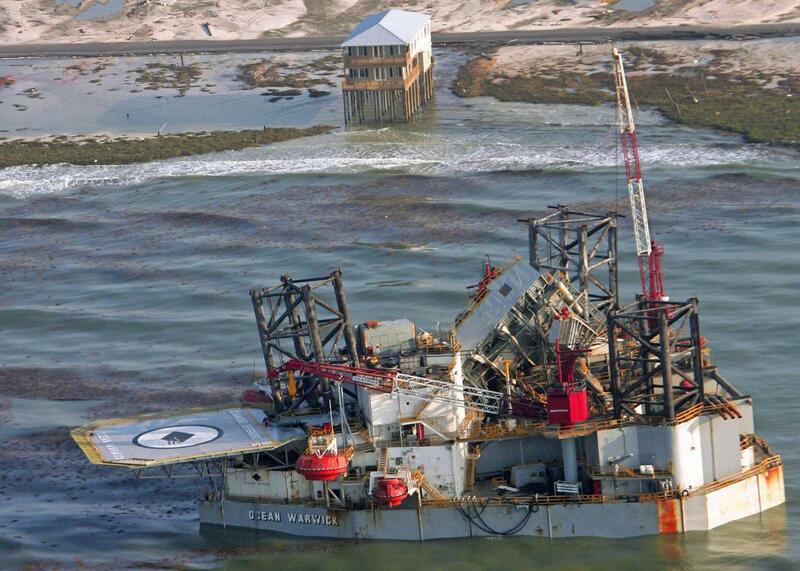 A damaged oil drilling platform, broken loose from its moorings during Hurricane Katrina, washes ashore at Dauphin Island, Alabama in August 2005. An Alabama company has agreed to a $20 million settlement and admitted that workers it brought from India to rebuild oil rigs after Hurricane Katrina were deceptively recruited and then forcibly corralled in squalid, overcrowded camps, the Los Angeles Times reports. The settlement covers several lawsuits brought against marine services company Signal International by 200 guest workers hired to perform pipefitting and other skilled work on damaged oil drilling infrastructure after the 2005 hurricane. The first of the lawsuits, coordinated by the Southern Poverty Law Center, resulted in a federal jury awarding $14 million in February to five former Signal employees. In March 2007, some of the SPLC’s clients were illegally detained by Signal’s private security guards during a pre-dawn raid of their quarters in Pascagoula. Two were detained for the purpose of deporting them to India in retaliation for complaining about the abuses and meeting with workers’ rights advocates. One worker who is a plaintiff in a separate suit was so distraught he attempted suicide. An economist who reviewed Signal’s records estimated the company saved more than $8 million in labor costs by hiring the Indian workers at below-market wages. As the first trial was getting underway this winter, Signal released a statement pointing blame for the workers’ treatment at the recruiters it sent to India and predicting that the initial denial of class action status for the workers meant the company would prevail in court. Signal will continue to defend against the accusations made against it by exposing the jury to the truth. Signal is confident the evidence will demonstrate, as the Court concluded in denying class certification, this case involves paid workers who could leave their job at any time, were well paid, and free to come and go as they pleased. The only consequence of quitting their job was returning to their home country, but that restriction was dictated by U.S. immigration law not Signal. The workers were brought in under H-2B visas, which allowed them to remain in the U.S. only if they were in the company’s employment, and deportation would have meant being sent back to India without a chance to pay off the staggering debt they’d taken on to pay the recruiters. “Signal understood the trap these men were in, and Signal took advantage of that,” attorney and SPLC board member Alan Howard told the New Orleans Times-Picayune after the first jury award in February. Signal declared Chapter 11 bankruptcy in a filing in Delaware this week, just before the $20 million settlement was announced, so the amount the workers receive will ultimately be determined in bankruptcy court. Still, bankruptcy won’t get Signal out of the public apology it’s compelled to issue as part of the agreement, and Howard says that the outcome of the case represents a major victory for foreign workers brought in by U.S. companies on temporary visas.